In a medium stainless-steel pot, combine the broth and wine and bring to a boil over moderate heat. Cook until the mixture is reduced to about 2/3 cup, 5 to 10 minutes. Reduce the heat to moderately low and add the Gorgonzola, cream, and butter. Bring to a simmer; cook, stirring, until the cheese melts and the sauce thickens slightly, about 5 minutes. Add the salt and pepper. Remove from the heat. In a large pot of boiling, salted water, cook the pasta until almost done, about 9 minutes. Add the broccoli florets and bring back to a boil. Cook until the broccoli and pasta are just done, about 3 minutes longer. Drain. 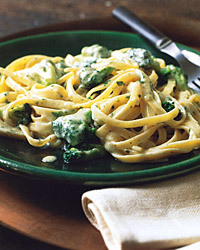 Toss the fettuccine and broccoli with the Gorgonzola sauce, Parmesan, and parsley. Serve with extra Parmesan. Variations Try the sauce and pasta with asparagus, green beans, or just fresh herbs instead of the broccoli. Strong-flavored broccoli and Gorgonzola are a challenge to match with wine. A Fiano di Avellino's intense taste can take them on, and its acidity will cut the unctuousness of the sauce.